Jackie and her husband did a wonderful job! We could've been happier. Thank you both for everything!!! Overall experience was amazing. I would definitely use her again..
Jeff and Drew were excellent. The original spot our venue had set up for them was a little tight because there were a ton of guests and ended up moving to a different location which didn’t phase either of them. They were both awesome and fun to work with and I am so excited they were able to capture these moments for the bride and groom! Thank you guys so much for making our day special! Everyone had such a fun time. Simply the best Photobooth experience! PhotoFunBooth has been by far the best photobooth company myself or my friends have used- and we’ve tried a few others over the years. This was our 2nd time using them- for my daughter’s Seeet 16 party with about 40 teens and 10 adults. In my backyard. Jackie (owner) was very responsive, helpful, flexible and personable. Their photos are hands-down the BEST quality and their props are great quality, fun, creative and plenty to choose from! Julie (attendant) was terrific! She was quick with her set-up, genuinely kind, great with the teens, super helpful, and a very nice to work with. She was able to get the various groups or pairs each their own copies quickly and everything went so smoothly. I highly recommend this company for your event. Great products, great service, great price point! I had such a great experience with PhotoFunBooth! They were so prompt and helpful, they also have a lot of options along the way to help you personalize everything! The Photo Booth also kept the kids at the wedding busy lol. Amazing!! Highly Recommend!! So Kind and Friendly!! PhotoFunBoothTucson was a HIT!!! Added an extra hour, my family and daughters friends LOVED it!! Thank you for having us Felicia. You were an absolute joy to plan and work with. Happy New Year and happy birthday to your sweet sixteen year old! Jacquelyn & her team were nothing short of AMAZING!! It was so much fun for my guests!! 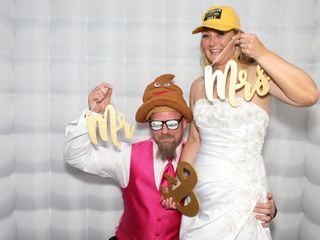 PhotoFunBooth had the best props, set up and printed out copies for my guests right on the spot to take home!! Not only did they keep copies for me and my husband as well, they went as far as making us a scrap book to take home at the end of the night!! We were THRILLED. Best thing we could’ve done. I cannot recommend them enough. My guests kept telling me how much they loved it. Thank you!!!! Thank you for including us in your big day. You were the sweetest bride ever and I had so much fun at your wedding with all your family and friends. We can't wait to work with you again! The photobooth we rented was such an amazing experience for our wedding. Everytime I talked with Jacqueline she was fast and professional and everyone at my wedding was saying the photobooth was the most worthwhile part of the wedding. Thank you so much for the kind words Nate. Your family was truly the sweetest. By the end of the night I felt like part of it! We wish you both a lifetime of happiness and bliss! Excellent! Everyone at our event had a great time taking pictures and sharing them. It made the party that much more fun! Thanks for everything! Very easy to work with and love the inflatable cube for pictures! Stephanie you all were an absolute blast! Thank you for choosing us to help capture fun memories of your celebration. Congrats and I hope to work with you again in the future. Jacquelyn Shopes PhotoFunBooth was awesome! 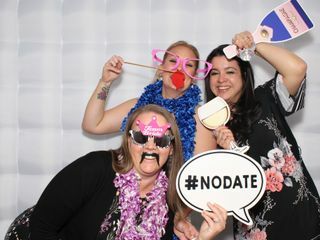 The photo booth was a hit at our wedding! With all the props and the scrapbook that was provided was all well put together! Definitely recommend for any special occasion! Thank you so much Michael. You guys were the best, and your guests were a lot of fun! We hope you had a great honeymoon and enjoyed the holidays together as a married couple. The booth was so fun, and the team made the experience very smooth and easy! Congrats Bianca. 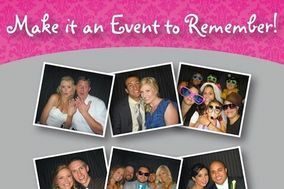 Your wedding reception was so much, the dance floor was on fire, and the photo booth was a big hit! Thanks for using PhotoFunBooth! We used PhotoFunBooth for my husband's birthday party at our home. Super easy to connect with Jackie, who did a great job working with me on the layout of the picture pages. She showed up on time and did a great job making sure all of our guests got their pictures taken. So much fun was had in that booth and the pictures were hysterical. We're still laughing at them days later. Can't go wrong with PhotoFunBooth!! Thank you for the kind words. I had so much fun at the party and can't wait to come back! Great experience so much fun, everyone enjoyed and had a blast. Staff is super friendly and respectful. We had a blast at Alexa's Quince! Your family and friends were so fun and sweet. Until next time! A hight light of my mom's 70th birthday party! Jackie and her team were absolutely amazing. She was flexible, very quick to respond and totally understanding of me changing my mind as I was trying to coordinate with my 3 siblings all in different states. In person she was wonderful, helpful and kind. We loved how the photos turned out! 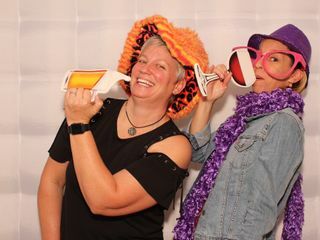 The Women In Business Conference highly recommends PhotoFunBooth. They will instantaneously add vigor to your event, just as they do ours every year! Thank you for having us! We can't wait for next year's conference. Just wow! We’re already coordinating use photofunbooth for my sister wedding. Staff was friendly and super responsive and super easy working with. They even reminded me on ideas I had for my big day! I can say they were great they even interact with my party to get the most use of the booth! Thank you so much Lenny! We had a ball with everyone at your party. Congrats again!!! THE BEST PARTY FAVOR/EXPERIENCE! Guest truly loved it and the staff! Thank you all so much! Everyone had the most fun and was so excited when it was opened up!!!! Thank you thank you thank you!!!! You will always be used for my future events! Thank you so much Adrianna and congrats on your graduation! We hope to see you again soon. They were amazing! Pictures turned out awesome!! Thank you for having us Susan. We look forward to working with you again in the future. Photo Fun Booth in Tucson was amazing! They were super friendly, always responded quickly, and worked with our budget. The pics were great and the staff was not less than polite. They were the best and I would recommend them for any even you’re having! Amber you were an absolute joy to plan and work with. Thank you for having us. Congrats on your graduation! Everything went very smooth, staff was wonderful and the set up was bad add! 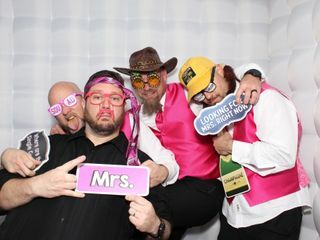 Thanks again and our wedding was a blast cause of the photo booth! Thank you Ray for having us at your wedding reception. We had to much fun and wish you and your beautiful bride a lifetime of happiness and laughter. I had a great experience with PhotoFunBooth. We have used their services in the past few years for our Second Chance Prom and have always appreciated their services. Thanks for having us again this year. It was a great time as usual. See you all next year! AMAZING SERVICE! I would highly recommend to anyone hosting an event. Jackie was so easy to work with and very flexible and cooperative when the weather was acting up! Thank you Hila! You were a joy to work and plan with. The weather was definitely interesting that day, but we made it work. Congrats on graduation! Jackie and her team were amazing. 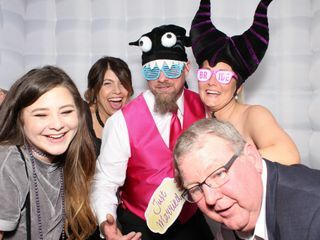 My guest loved the photo booth so much! It was great to look back and see all the fun photos! Thank you all for spending our day with us! Thank you and Joseph for having us! Your wedding was just perfect and your guests were so much fun! Congrats again! An absolute wonderful experience!!! I saw PhotoFunBooth at a friend’s wedding 3 years ago and made an awesome scrapbook page for their wedding and I just HAD to have the package that included the scrapbook for my own wedding (your guests get to design pages and you get a surprise to open later and see what everyone did.) The options for photostrips were numerous and we got to customize what the strip said. Some of my guests didn’t realize they were supposed to make a page for the scrapbook though but it looked like most of the images made it in. I loved the different options and I loved the response times I got while asking questions and needing help. Would recommend every time!! 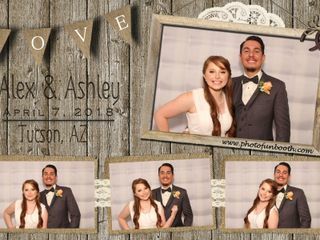 Ashley your wedding was just beautiful, as were you! Thank you so much for having us share in your special day. We had fun making memories with you all. Congrats! You were absolutely fantastic. No one expects to hear their guests boast about the quality of their photo booth. Thank you for the kind words Kevin! Congrats! Enjoy your new home with your beautiful bride.